Although I have written number of functions in the current version of the OpsMgrExtended module that allows you to create some popular types of rules in OpsMgr (i.e. perf collection rules and event collection rules). 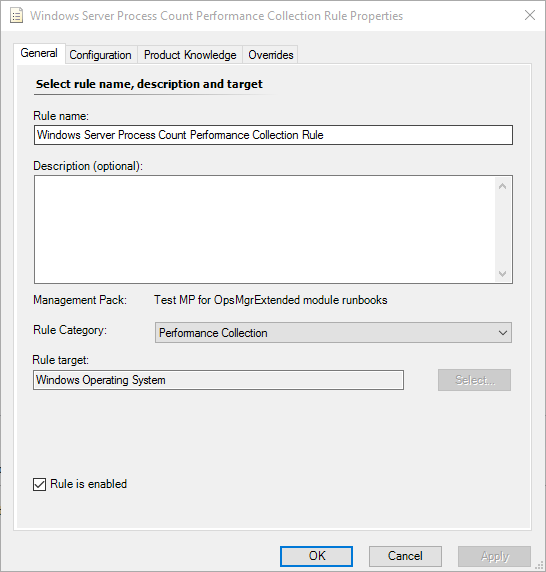 Sometimes, you still need to create other types of rules, such as WMI event collection rules, or rules based on module types written by yourself. In this post, I will demonstrate how to create any types of rules using the New-OMRule function. 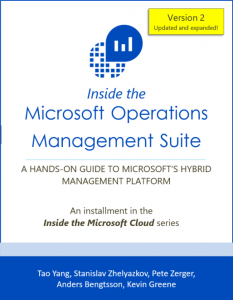 Additionally, since the OpsMgrExtended module can be used on both your on-prem SMA infrastructure as well as on your Azure Automation account (with the help of Hybrid Workers), and pretty much all the previous runbooks and posts are based on SMA, I will use Azure Automation in this post (and maybe in the future posts too). I will demonstrate 2 sample runbooks in this post. 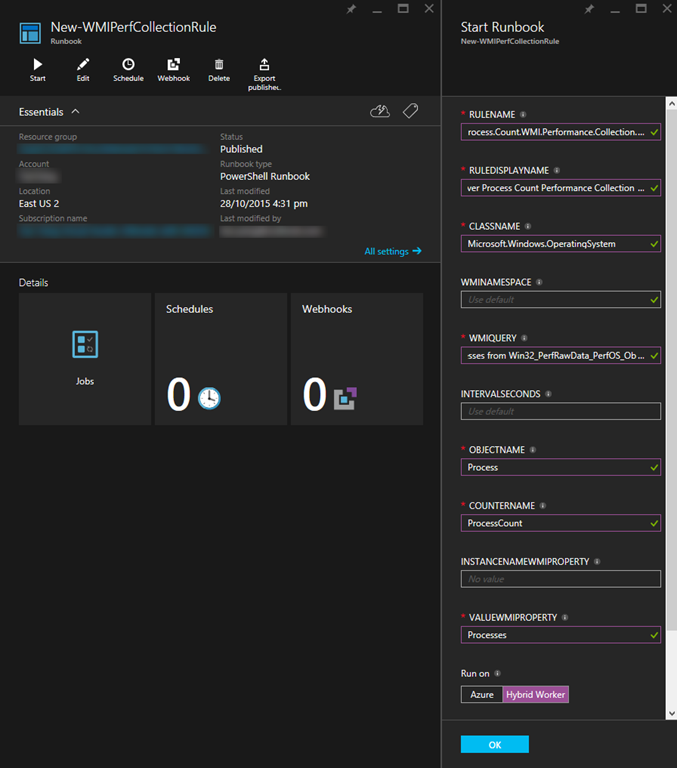 Since Azure Automation now supports PowerShell runbooks on both Azure runbook workers as well as on hybrid workers, with the 2 sample runbooks I’m going to demonstrate, one is based on PowerShell workflow and the other one is a PowerShell runbook. What Components are OpsMgr Rules Made Up? 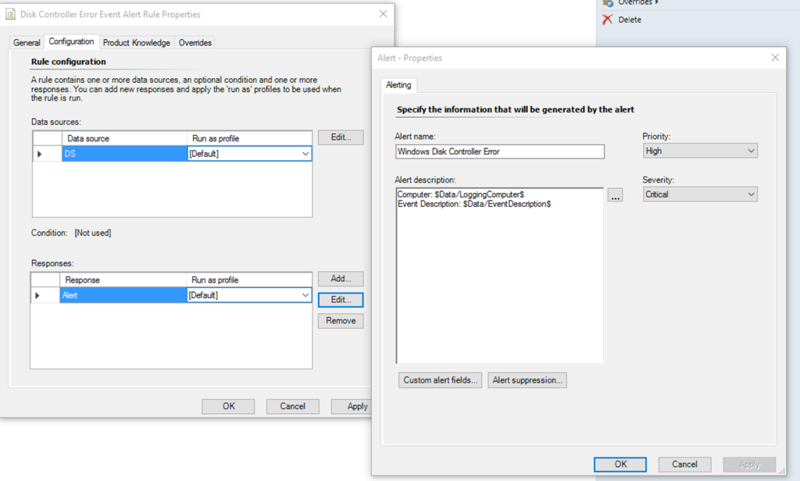 To explain in plain English, a rule can have multiple data source modules and write action modules, but condition detection module is optional, and you can only use up to 1 condition detection module in your rule. The order of execution is Data Source Modules –> Condition Detection Module –> Write Action Modules. Additionally, some modules requires mandatory and/or optional configuration parameters (i.e. 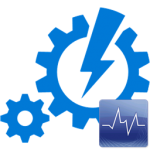 System.SimpleScheduler), some modules do not require any configuration parameters (i.e. 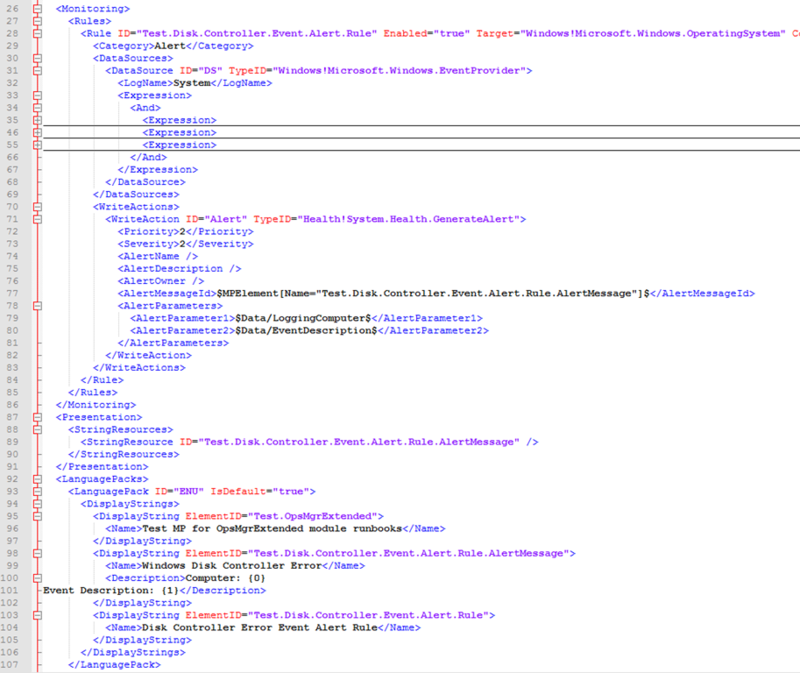 Microsoft.SystemCenter.CollectPerformanceData). i.e. in the example below, I have high lighted the information required in a member module of a rule. I needed to figure out a way to enforce users to supply all required information listed above. In order to do that, I think the best way is to define a class for member module configurations and another class for alert configurations. However, since class definition is a new concept only been introduced in PowerShell version 5 (which still in preview other than Windows 10 machines at the time of this writing), I could not do this natively in PowerShell. In order to work around this limitation, I have defined these two classes in OpsMgrExtended.Types.dll using C#. This DLL is shipped as part of the OpsMgrExtended module. 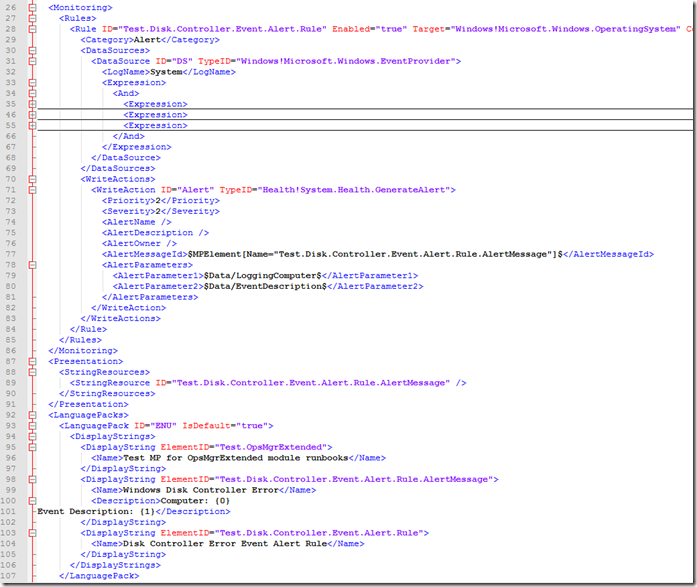 The OM-Rule is expecting instances of these classes defined in OpsMgrExtended.Types.dll as input parameters. You will see how I used these classes in the sample runbooks. Write-Verbose "Importing OpsMgrExtended PS module." Write-Verbose "Configuring Data Source modules." Write-Verbose "Configuring Condition Detection module." $ConditionDetectionConfiguration = New-OMModuleConfiguration -ModuleTypeName $CDModuleTypeName -Configuration $CDConfig -MemberModuleName "MapToPerf"
Write-Verbose "Configuring write action modules." 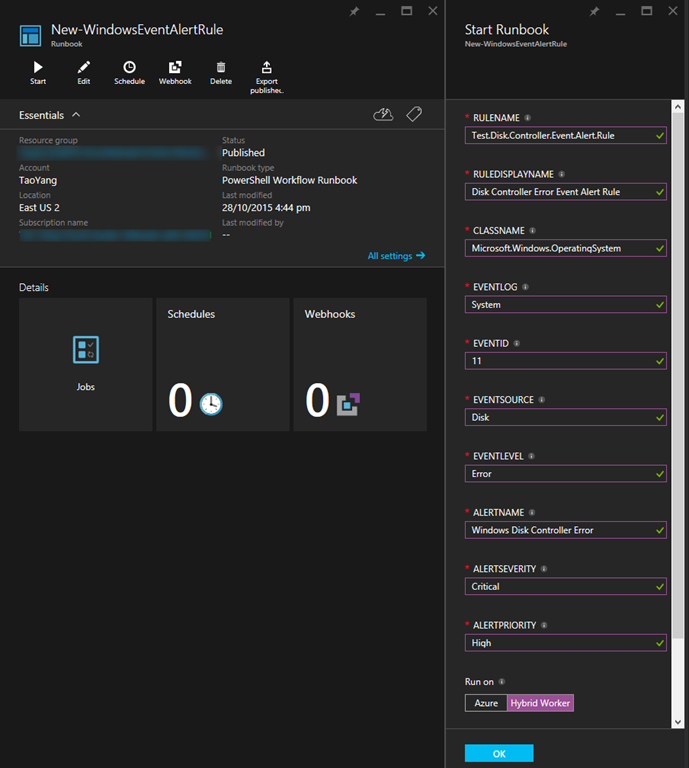 $WAWriteToDBConfiguration = New-OMModuleConfiguration -ModuleTypeName "Microsoft.SystemCenter.CollectPerformanceData" -MemberModuleName "WriteToDB"
$WAWriteToDWConfiguration = New-OMModuleConfiguration -ModuleTypeName "Microsoft.SystemCenter.DataWarehouse.PublishPerformanceData" -MemberModuleName "WriteToDW"
$WAWriteToOMSConfiguration = New-OMModuleConfiguration -ModuleTypeName "Microsoft.SystemCenter.CollectCloudPerformanceData" -MemberModuleName "WriteToOMS"
$ErrMsg = "Invalid rule name specified. Please make sure it only contains alphanumeric charaters and only use '.' to separate words. i.e. 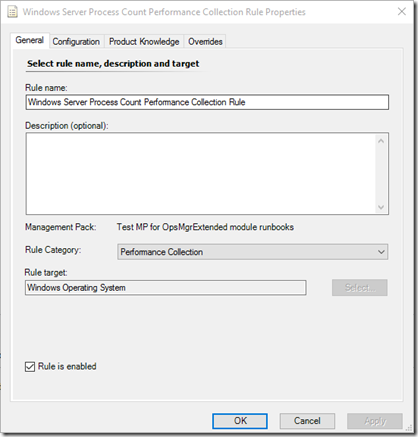 'Your.Company.XYZ.WMI.Performance.Collection.Rule'." IntervalSeconds – the rule execution interval in seconds. 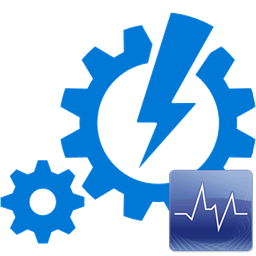 this is optional, if not specified, the default value of 900 (15 minutes) will be used. 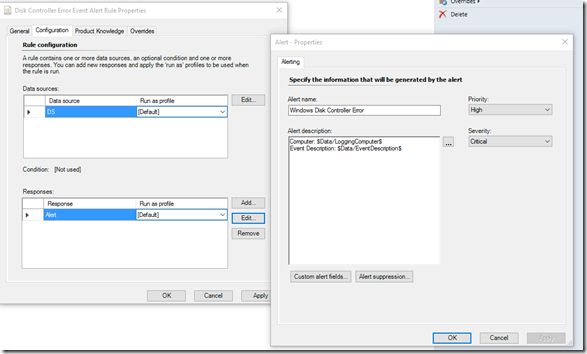 InstanceNameWMIProperty – the property returned from the WMI query which represent the performance data instance value (i.e. 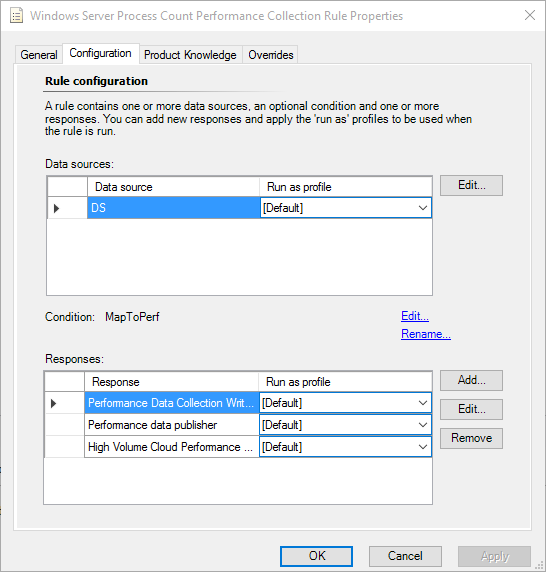 if you are collecting logical disk counters, the result of WMI query may contain a property that represent the drive letter, which can be used to identify the instance in perf data). This is optional, if not specified, the perf data instance name would be “_Total”. 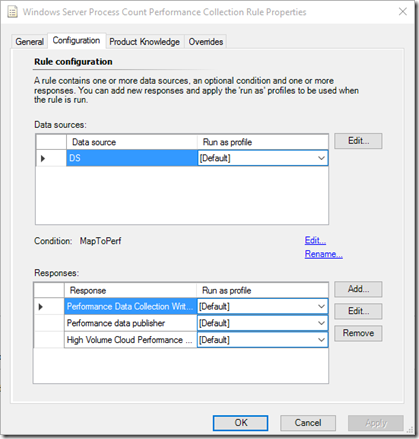 ValueWMIProperty – the property returned from the WMI query that represent the perf value. 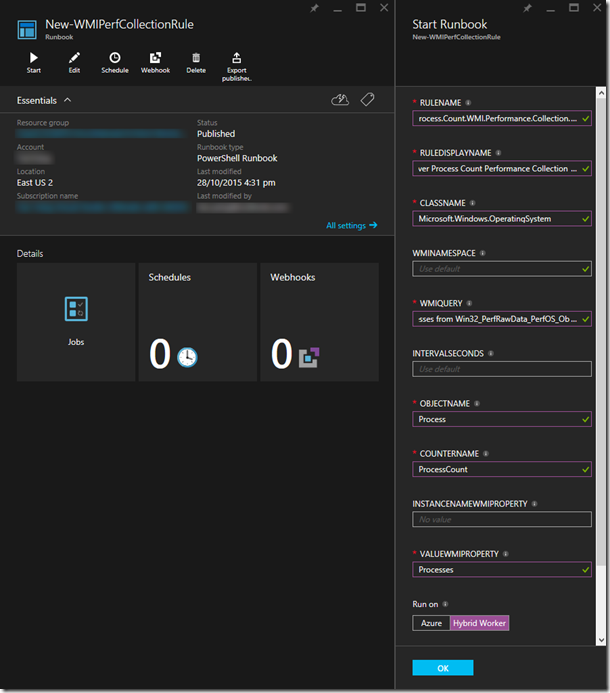 The first step of this runbook is to retrieve a connection object named “OpsMgrSDK_Home” from my Azure Automation account (or SMA). This connection object is pre-configured, which contains the computer name of one of my OpsMgr management servers, and the credential of a service account which has OpsMgr admin privilege in my management group. The runbook also needs to explicitly import the OpsMgrExtended module. During the test, I found for this PowerShell runbook, I must manually import the module using Import-Module cmdlet in order to load the assemblies defined in the OpsMgrExtended.Types.dll. 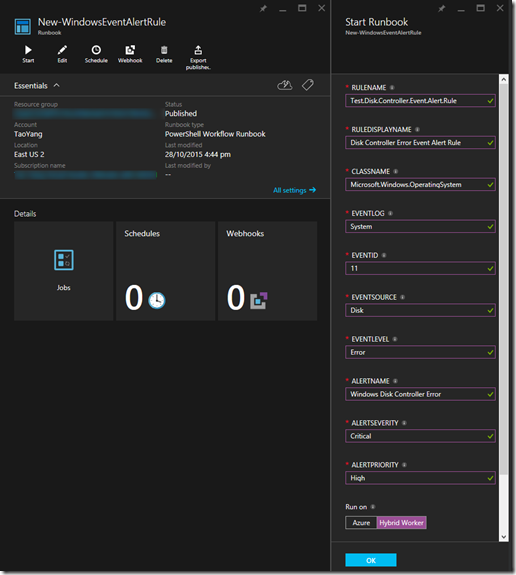 Since we are going to be using hybrid workers, you must manually deploy this module to your hybrid workers because at the time of this writing, Azure Automation is not able to automatically deploy required modules to hybrid workers. To explain in English, the rules created by this runbook would periodically execute a WMI query (Data source module), then map the result from WMI query to OpsMgr performance data (Condition detection module), finally store the performance data in OpsMgr operational DB, data warehouse DB and also OMS workspace (3 write action modules). I have placed the module type name, module configuration and the member module name into separate variables and passed them to the New-OMModuleConfiguration function and created a module configuration object for the data source module. On the other hand, since the condition detection member module is optional, and you can only have maximum one condition detection member module, you do not need to place the module configuration object for the condition detection module into an array. Lastly, I have hardcoded the management pack name to be “Test.OpsMgrExtended” in this sample runbook. this MP must be created prior to running this runbook otherwise it would fail. However, if you have a look at the sample runbooks in previous posts, you can easily figure out a way to firstly detect the existence of this MP and use this runbook to create the MP if it does not exist in your management group. $ErrMsg = "Invalid rule name specified. Please make sure it only contains alphanumeric charaters and only use '.' to separate words. i.e. 'Your.Company.XYZ.Event.Alert.Rule'." As you can see, firstly, other than the standard process of retrieving the connection object for my OpsMgr management group, I have used several “Switch” statements with inline scripts to translate the event level, alert priority and alert severity from English words (string) to numbers (integer), because when configuring member modules for OpsMgr rules, we must use the number (instead of names). Note I’ve also used “ValidateSet” to validate the input of these parameters, so only valid inputs are allowed. LanguagePackID – the 3-letter language pack code for the language pack that you wish to create the alert message under. this is an optional parameter, if not specified, the default value of “ENU’’ will be used. and based on the output, the folder in “C:\Program Files” is not listed! Therefore, I had to move the module to another location (C:\Windows\System32\WindowsPowerShell\v1.0\Modules). after the move, the runbook started working. 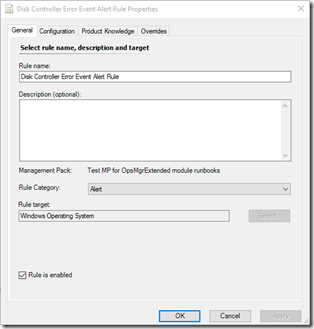 In this post, I have demonstrated how to use the New-OMRule function from OpsMgrExtended PS module to create any types of rules in OpsMgr. Although OpsMgrExtended module has already shipped two other functions to create event collection and performance collection rules, the New-OMRule fills the gap that allows users to specify each individual member module and its configurations. This is probably the most technically in-depth post in the Automating OpsMgr series. 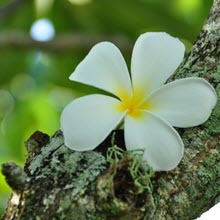 I have tried my best to explain and demonstrate how to use the New-OMRule function. But if you are still unclear, have questions or issues, please feel free to contact me. I haven’t figured out what I will cover in the next post, but I still have a lot to cover in this series. Since I am attending few conferences in the coming weeks in November, I probably won’t have time to work on part 20 until end of November. Until next time, happy automating!